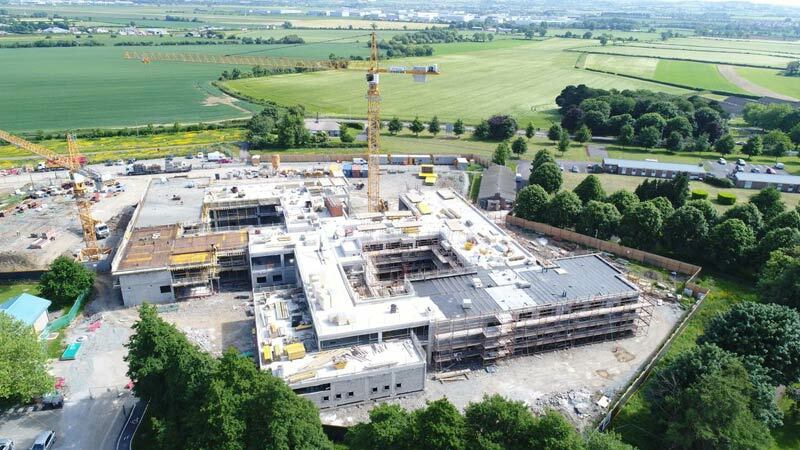 A new building which will provide 50 replacement Older Persons residential beds and a new 50 bed rehabilitation unit, is well under way by Peamount Healthcare at its campus in Newcastle, Co. Dublin. This developmentwill be a support to the acute hospital system for the early transfer of patients for follow on care. The new build commenced in October 2017 and will be completed in April 2019. The €24 million development is co funded by the sale of lands belonging to Peamount Healthcare and a significant capital investment from the Health Service Executive. Peamount Healthcare, an independent voluntary organisation, has a long history dating back to 1912 when the facility opened as a Tuberculosis Sanatorium. It quickly became the largest such unit in Ireland and developed as a centre of excellence delivering high quality care to patients and service users and this ethos continues. In the 1960s, Peamount changed service direction and opened residential services for Intellectual Disability. Operating in partnership with the HSE, Peamount Healthcare currently has 219 beds between campus and community services. with a headcount of 540 employees.